On May 22 Mars will reach opposition. See this post for the geometry. 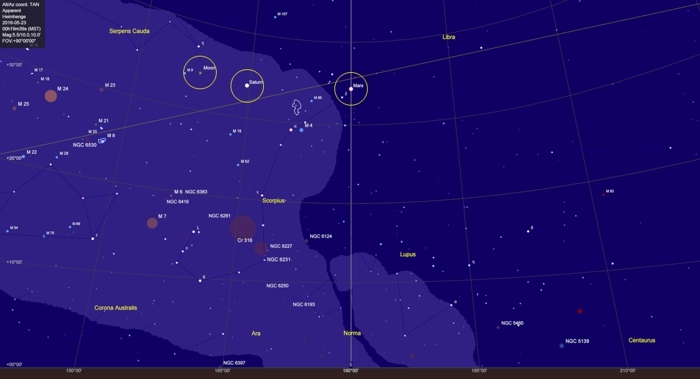 Bottom line — Mars will be close and large and bright, shining at magnitude -2.1. That outshines Sirius (M = -1.46), the brightest star in the sky. Saturn, approaching its June 2 opposition, will be 12° east of Mars glowing at M = +0.1. And tonight only, as a special bonus, the Full Moon will be 6° east of Saturn. You shouldn’t need a chart to spot this trio, but you can click the one above for a larger copy. Mars rises at sunset, around 7:30 pm, followed by Saturn and the Moon. All three will track across the sky in unison. The chart shows their position when Mars culminates (reaches its highest elevation). This occurs at midnight, when Mars is due south, but you need not wait till then. All three objects will be visible by 9:00 pm. Hoax advisory: I really have to mention this, since so many people forward me “astronomy” emails. 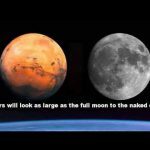 Every Mars opposition spawns a flurry of emails with doctored images that show how “Mars will appear as large as the Full Moon.” Read my lips: This. Never. Happens. Click on the thumbnail to see a hoax email I received last week. 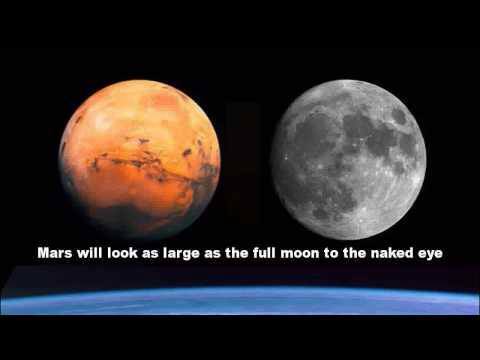 When Mars is at closest approach it appears about 1/70 the size of the Moon. 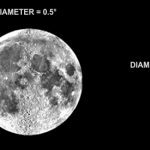 For Mars to appear as large as the hoax image, it would have to be so close that it would disrupt the Earth-Moon system. 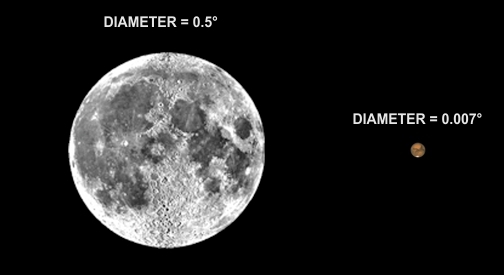 Mars is about twice the physical size of the Moon, but it’s 650 times more distant. The thumbnail below shows a true visual size comparison. Mars culminates at an elevation of 34°33′, so it will be lower in the sky than most oppositions. Still, it will be the brightest object in the sky (after the Moon) and well worth a look. Even using binoculars, its orange disc should be apparent. Saturn’s rings, now near maximum tilt, should also be visible. The Full Moon will interfere with observations of fainter objects, but Mars and Saturn are bright enough to compete. Head outside on May 22 to view this cosmic trio.